Goat meat is my newest favorite red meat as it is much leaner than Beef. I really enjoyed my doubled cooked ribs and I hope you do too 🙂 . I must warn you that if you follow culinary cooking instructions like Food Network Chopped, then I fail 😉 . As you know Indian cooking does not have rare or medium-rare in the meat cooking vocabulary. We cook our meats so much that having any meat bacteria is almost a 0% possibility. All meats in India are chewy. My mama’s reasoning…. the animals were made to work first before they were killed (Sorry my dear vegetarian and vegan friends. Not so nice conversation ). So there you go, I love chewy dry meats 🙂 . You can use this marinade for any meats, paneer and firm tofu. To make a nice roast or for grilling. My choice to add mint is that it goes well with goat or lamb. Wash the meat and pat dry with a paper towel. 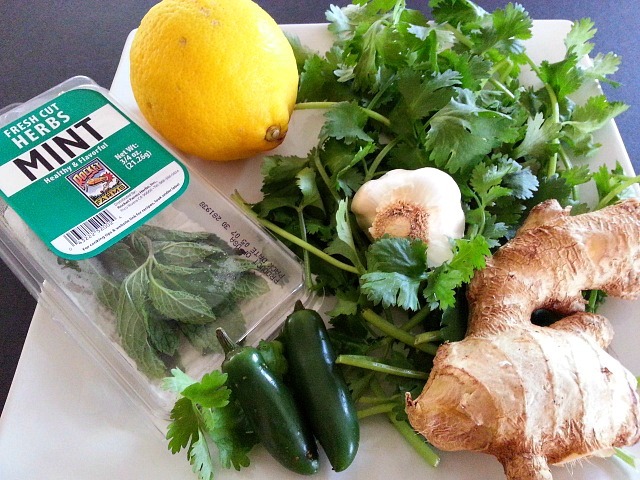 Grind the mint, cilantro, ginger, garlic, lemon,jalapeno to a paste. Apply the marinade, season with salt and let stand in the refrigerator for at least 45-60 minutes. It is much flavorful if kept overnight. Either grill the meat if you like. Or you can double cook by braising it first and then giving the meat a quick char. In a pot, braise the goat chops with 3/4 cup water for 40-45 minutes. Then on a lightly coated cast iron pan char the goat chops for 2 minutes on each side. 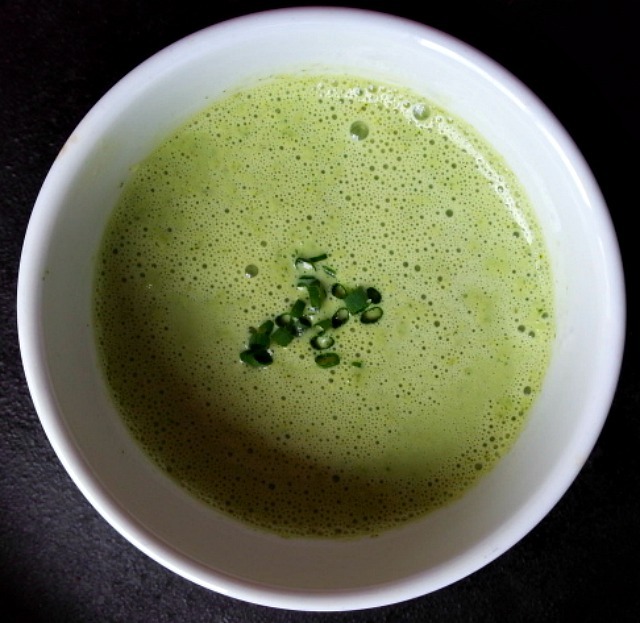 Enjoy with some good ole mash or as an appetizer with some mint yogurt dipping sauce. * Blend well the above ingredients and Voila!. Store well in the refrigerator for couple of days. 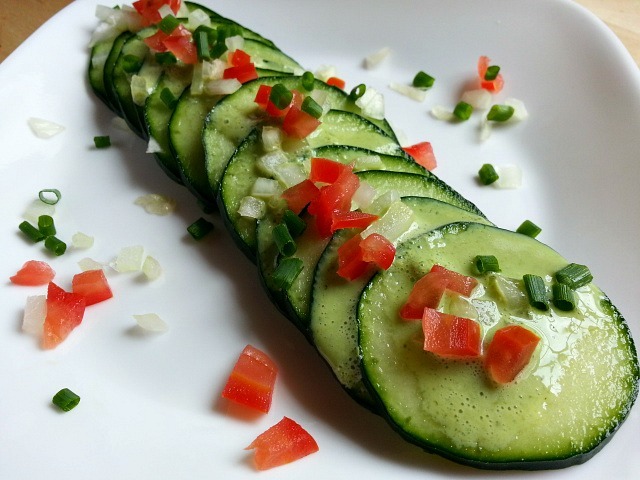 Enjoy as a healthy salad dressing. Looks really good. I think I’m gonna try this today. Goat! I just have to try this recipe. But where will I find goat? I have eaten it often on holiday but have never seen/bought it here in the Netherlands. Although it is such an international country I must be able to find it. I will keep my eyes open. Thanks for the inspiration! Hello! What a great recipe this looks like! I think I’ll try it tomorrow! You have been following my blog for a while, and I just followed you. I was wondering if you wanted to exchange guest posts. This means that I would write a guest post on your blog, and you could write one on mine. This is totally just a suggestion that I think may help both of our blogs. The way this would work is I would send you a post, and you could review it to make sure it meets your standards. I would do the same with the post that you sent me. We would then let the other know what changes or edits we made on the others post. Once that was reviewed, we would post them to our blogs. The reason for doing this is to help drive traffic to both of our blogs. if you’re wondering what to say in the guest post, you could share your best recipe and tell a little it about yourself. It is completely up to you. If you’d like to, then please let me know. Have a great day! And best wishes! Of course. Take as much time as you need! Can you substitute anything else for the cilantro? Harry parsley maybe the closet substitute or you can skip it as mint has a much stronger flavor. Thank you so much for your kind words April 🙂 . Thank You so much and I am truly sorry to be missing your post. My wordpress reader has been randomly missing on displaying many blogger post and looks like it is problem. Looks delicious, especially the mint sauce! I love the recipe for your dipping sauce! 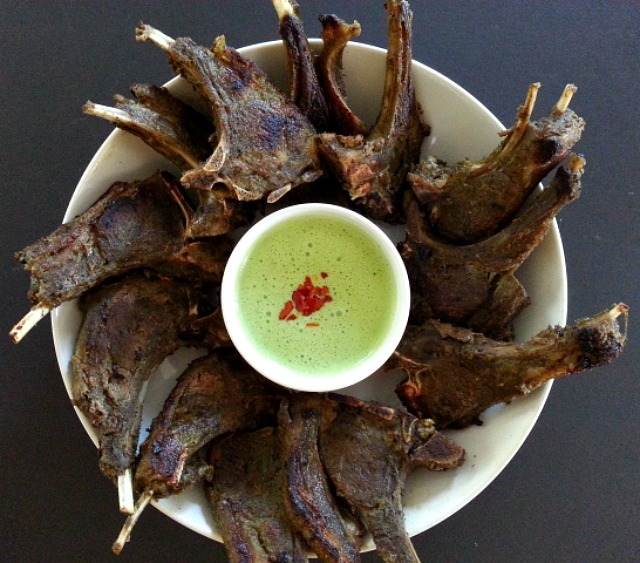 I don’t like lamb but I love chivo (Mexican style goat)! I have not yet tried goat meat. My husband eats it. It took me becoming an adult and cooking meat myself before I realized I liked it. Back when I was young the way to cook stuff was, let’s just say diffferent. The recipe sounds delicious! I need to get over my fear of goat, I mean, I eat goat cheese so why not? Thank you once again for a palate expanding inspiration. Love the salad! Thank You so much. It has the same gamey/ musky taste as goat cheese. If you eat lamb then it is not much different. You are welcome, and I love lamb! Goat is a favorite along the US-Mexico border. Your version looks delicious. Your images – as always – are beautiful. Yum!! It looks so good!! Yep, goat is about my favorite form of red meat… this looks great! 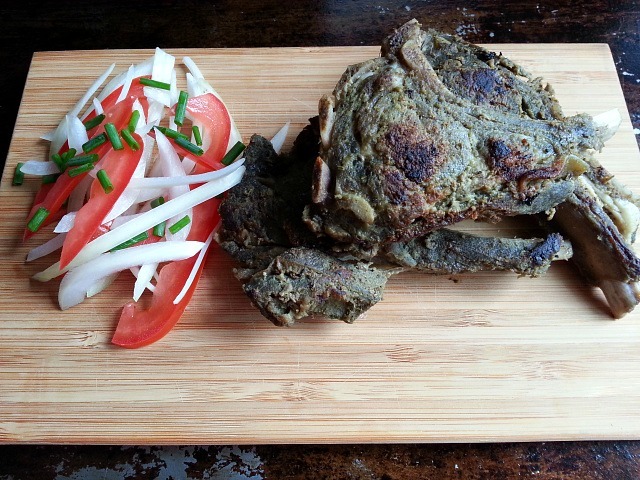 This has got to be another of Your HIT Herb goat chops with mint yogurt sauce looks PHENOMENAL. The mussus normally prepares a goat xacuti, which the whole family enjoys. 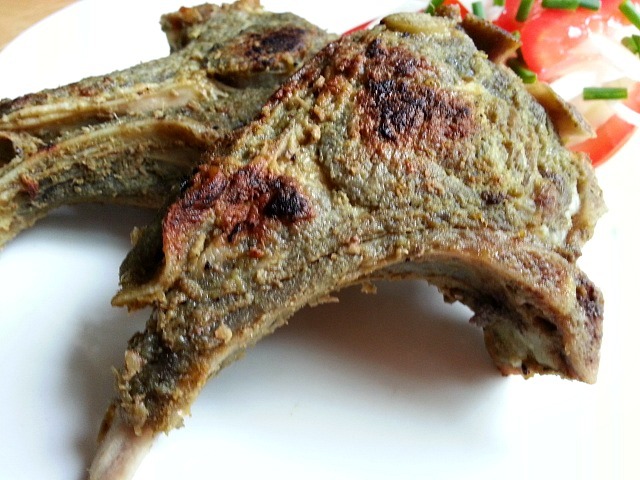 I remember Me late mum would never buy goat meat in Goa because She said all You get is bones. I think She had a point there. Here in England, We get Our supply from Arab butchers in Brixton,London. No goat is sold in British supermarkets. The meat They sell is decent, in other words it has got a lot of meat. Will have to give Your recipe a go. And I bet it will turn out as good as it looks. It is a nice sunny day in Surrey,England today. I don’t know how long it will last. It is anybody’s guess. We will make hay while the sun shines. Pardon the pun. We are off to London for the day. Have a SPLENDID weekend. Thank You Mr Stan for your kind words. Your mum was right. The meat-to-bone ratio is way less in Goa. We too get our meats from Pakistani stores as it is not available in any other stores. I am sure the goat xacuti must be awesome. You and Mrs Stan have a great sunny weekend 🙂 . I thoroughly enjoy Goat. Cooked up with some onion and potato and then eaten in a tortilla or with Naan. That is so awesome. You recipe sounds delicious 🙂 .